For the American herb, see Osmorhiza. For other uses, see Cicely (disambiguation). 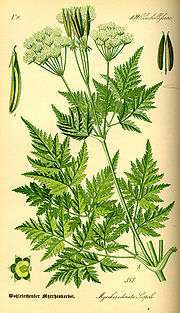 Cicely /ˈsɪsəli/ or sweet cicely (Myrrhis odorata) is a herbaceous perennial plant belonging to the celery family Apiaceae. It is one of two accepted species in the genus Myrrhis. Its leaves are sometimes used as a herb, either raw or cooked, with a rather strong taste reminiscent of anise. The roots and seeds also are edible. Additionally, it has a history of use as a medicinal herb. Like its relatives anise, fennel, and caraway, it can also be used to flavour akvavit. Its essential oils are dominated by anethole. 1 2 "The Plant List, Myrrhis odorata (L.) Scop.". ↑ Chisholm, Hugh, ed. (1911). "Cicely". Encyclopædia Britannica. 6 (11th ed.). Cambridge University Press. p. 353. ↑ Stace, C.A. (2010). New flora of the British isles (Third ed.). Cambridge, U.K.: Cambridge University Press. p. 450. ISBN 9780521707725. Wikimedia Commons has media related to Myrrhis odorata.